Amazon Mechanical Turk’s base commission will be 20% with a $0.01 minimum per transaction. This commission applies to HIT reward amounts and any bonuses paid to Workers. HITs requiring 10 or more assignments will incur an additional 20% commission above the base commission. These HITs comprise less than 0.3% of Mechanical Turk’s overall HITs, and are most commonly used by Requesters to survey Workers and conduct market research. The incremental commission for using Masters Workers will decrease to 5%, making it even easier for Requesters to access the marketplace’s highest-rated Workers. These changes will help allow Amazon to continue growing the Amazon Mechanical Turk marketplace and innovating on behalf of our customers. You can learn more about these changes here: http://requester.mturk.com/pricing. If you have any questions, you can contact us at: https://requester.mturk.com/contactus. The SPSP Blog has a good summary of the underlying issues and the emergence of the #mturkgate hashtag. The email matters because MTurk has become a major platform for two things: (1) crowdsourcing human computation tasks (e.g., image moderation, transcription, etc. ), and (2) academic survey-experimental research. The fee changes affect the latter group particularly hard because a “HIT” for an academic study will typically involve several hundred or thousand assignments (see the second bullet point in the email). This means that in reality, the fee increase is actually from 10% to 40% rather than 10% to 20%, as for HITs with fewer than 10 assignments. As something of an aside, less discussed is the fact that the fee changes also affect projects with many HITs but few assignments per HIT. So called “penny HITs” are typically incredibly simple tasks that can be performed in a matter of seconds and simply require, for example, an up/down vote on whether an image matches a certain description. (Workers often use these HITs to boost their performance statistics, which affect their qualification for other HITs.) These HITs will typically pay just $0.01 or maybe $0.05, but offer workers thousands of individual tasks in a “batch”. The first bullet point in the email mentions that the minimum per transaction fee will increase to $0.01 (up from $0.005). Amazon charges this minimum because penny HITs would, at the previous rate, only pay Amazon $0.001 per assignment. The change (from $0.005 to $0.01) doesn’t seem like a lot, but for penny HITs that fee increase is enormous. Imagine, for example, that you are a requester posting 100,000 images to be categorized and you pay $0.01 per task. Under the old pricing, you would pay $1,000 to workers (100,000 * 0.01 = 1000) plus $0.005/assignment to Amazon (100,000 * 0.005 = 500), for a grand total project cost of $1500. Under the new pricing scheme, the fees to Amazon have doubled, making the total cost of this penny HIT project drmatically more than it would be under the current scheme. Rather than paying a 50% fee on these tasks, requesters will now pay a 100% fee. The commission fees paid to Amazon will quadruple. The commission fees paid to Amazon is 400% of what is today. There will be a 300% increase in commissions paid to Amazon. The old commission fees were 25% of what they are under the new scheme. The old commission fees were 75% less than they are under the new scheme. There will be a 30-percentage point increase in commission fees. The old commission fees were 30-percentage points less than under the new scheme. There will be a 27.3% increase in the total cost of a project. The proportion of the total cost of a project going to Amazon will increase from 9.1% percent to 28.6%. The proportion of the total cost of a project going to workers will decrease 91.0% to 71.4%. The ratio of worker payments to Amazon commission fees will decrease from 10:1 to 5:2. The ratio of Amazon commission fees to worker payments will increase from 1:10 to 2:5. If requesters hold total project costs constant, workers can expect to receive 21.4% less. If requesters hold total project costs constant, workers can expect to receive 79.6% of what they previously received. If requesters hold total project costs constant, workers received 25.7% more under the old fees. If requesters hold total project costs constant, workers received 125.7% of what they will receive now. The fact that I can express a relatively simple change (fees moving from 10% to 40%) in so many ways is a good reminder to take a minute and think about how best to express that change. Obviously, “fees quadruple” sounds horrendous and “300% increase in fees” sounds bad, but maybe not quite as a bad. A “27.3% increase in total costs” sounds bad, but maybe not that bad given that Amazon has never previously raised their fees. When we express the change as the share of total costs going to workers decreasing from 91.0% to 71.4% or that workers can expect to receive 21.4% less highlights why #mturkgate emerged: requesters talking about fleeing MTurk because they will pay 27.3% more is interesting given that workers might expect to receive 21.4% less for the same work. It’s incredibly easy to frame numbers both to serve one’s objectives and to mislead about the size of the underlying values. 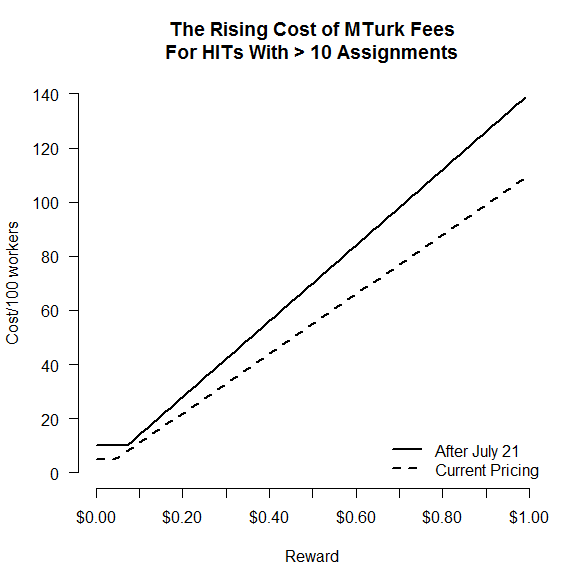 Graphing can help, but it’s also important to remember that the fee increase is a slope change, not a change in functional form, so regardless of the cost of your MTurk project the cost will only be 27.3% higher. There is no exponential increase in cost. If one were to extend the axes of my graph to infinity, the picture would remain the same with the new line being 27.3% higher than the line representing current costs. (Though a graph with an expanded x-axis would cover up the enormous increase in total cost for penny HIT projects.) As a requester, I was concerned about total cost, so I graphed that in what I thought was the most useful way. If one’s concerns are different, they can follow any of the different ways of framing the change listed above and draw a different graph that emphasizing the change most relevant to them. But, the key point I want to make is that there was a lot of confusion, or perhaps even miscommunication, about the implications of the new fees because individuals expressed that change in different terms (percentages, changes in percentages, ratios, fractions, etc.). I’ll run away from a 300% increase but I can probably cope with a 27.3% increase (unfortunately for many, achieved through a mix of smaller samples and lower worker rewards). It’s easy to get caught up in the numerical framing and lose the larger picture. Fractions, percentages, and changes are the bread and butter of scientific communication, so I thought this conversation was an excellent case study in the challenges of communicating numbers. Hopefully it serves as a reminder to be clear (both to ourselves and to others) about what we mean when we talk about a numeric change or effect.